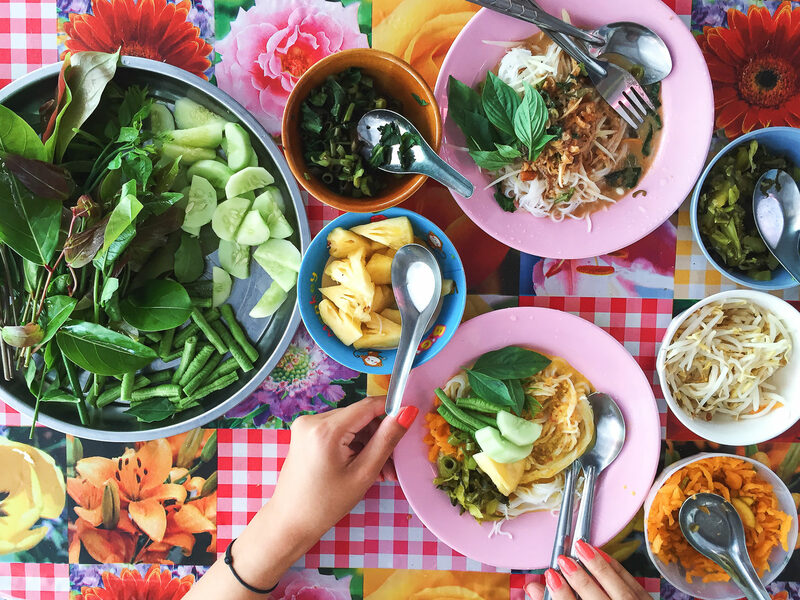 A few years ago we shared some of the vegan street food we tried at the Phuket Vegetarian Festival, since then we’ve returned to the festival and enjoyed even more sweet and savory vegan treats. The Phuket Vegetarian Festival, also known as the Nine Emperor Gods Festival, is scheduled for October 8th-17th in 2018. Each year the dates vary since the festival is scheduled according to the start to the 9th month in the lunar calendar. If you plan on attending the festival, we recommend staying in Phuket Town. The epicenter of the festival on the island is along Ranong Road near the Jui Tui Shrine in Phuket Town. 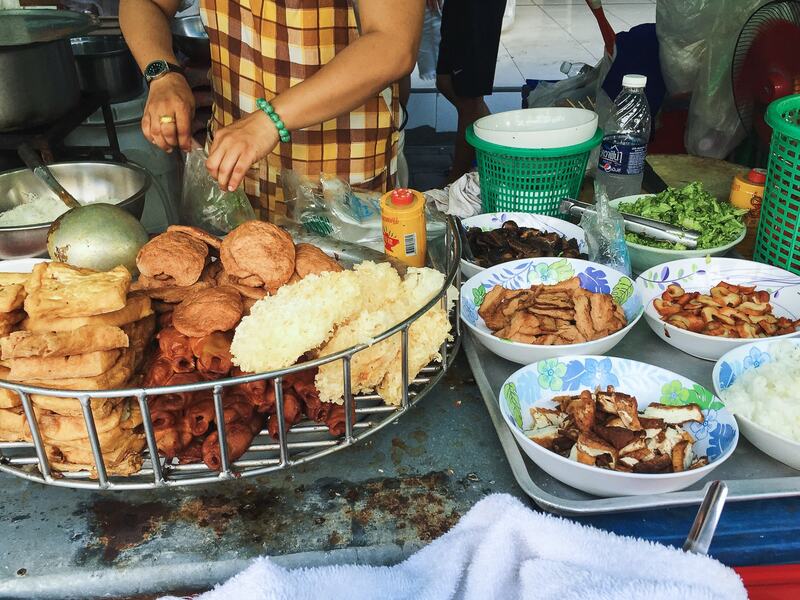 Here you will find the highest concentration of vegan street food during the festival. Though the festival is celebrated throughout the island, staying in Phuket Town provides the most convenient and broadest options. Vegan food stalls set up around every shrine on the island, so there are a number of highly concentrated areas adorned with yellow and red flags during the festival. Along with Phuket, the festival is celebrated across a multitude of Southeast Asian cities to varying degrees. Bangkok, especially in the Chinatown area, and Penang are two of the communities with larger celebrations outside of Phuket. 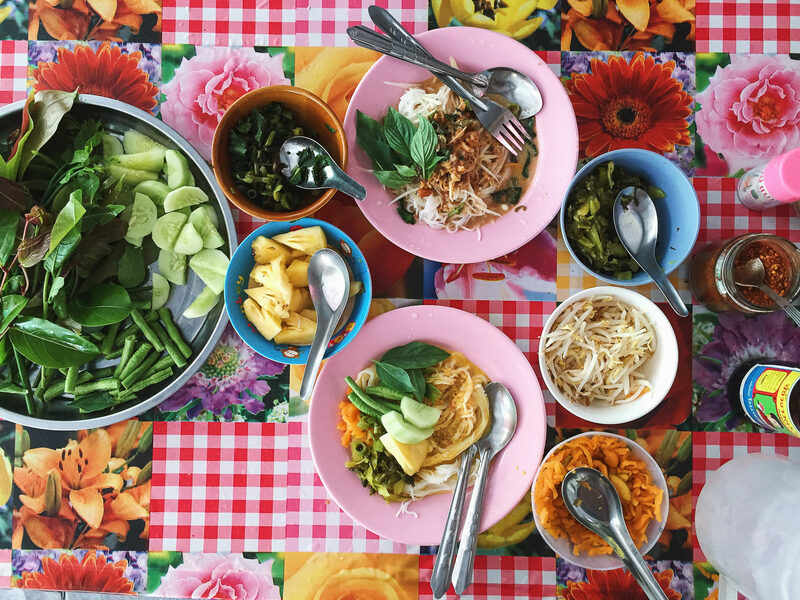 When on the lookout for vegan food during the festival, simply look for the red and yellow flags and the Thai word เจ (jay/jeh/jae). Vegan products in stores, restaurant menus and market flags will all carry the red and yellow เจ to help easily identify some of the delicious vegan options available in Thailand during this unique festival. 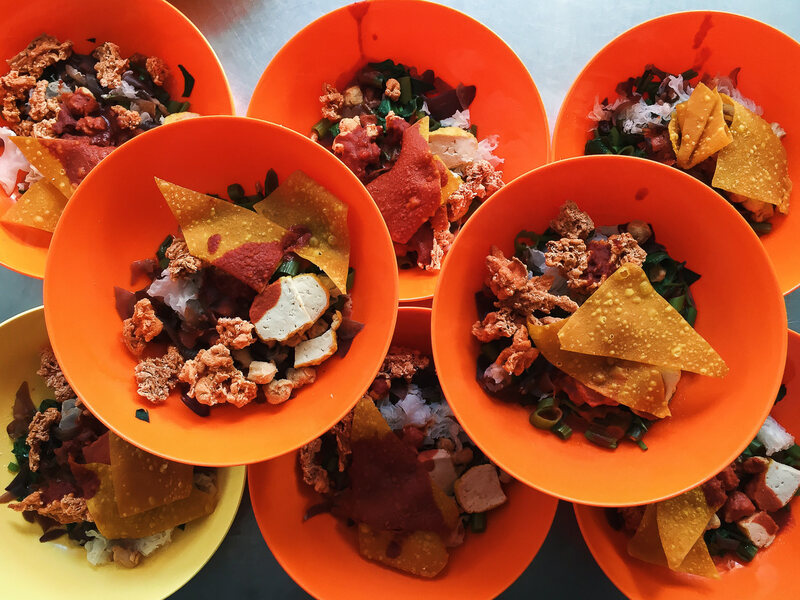 For more on เจ foods and our past visit to the Phuket Vegetarian Festival visit our post Phuket Vegetarian Festival: Vegan Street Food. 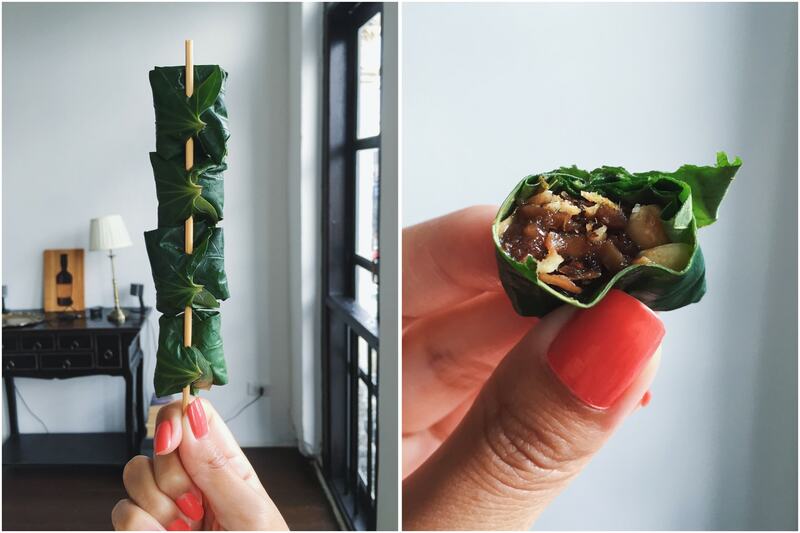 These little treats pack every corner of the Thai flavor profile in each bite. 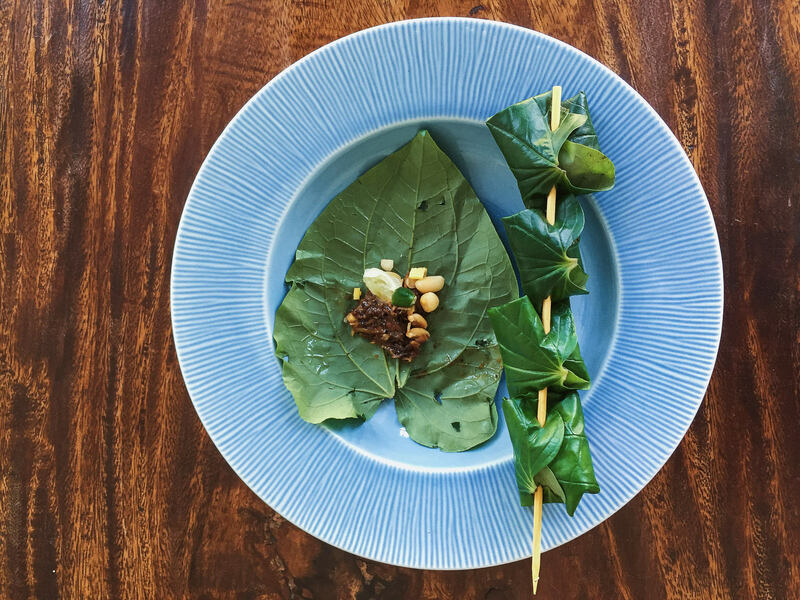 Chili, lime, peanut, ginger, candied coconut & sugar are all wrapped in a cha phlu leaf (sometimes called wild betel leaf). There’s so much depth and flavor in each little morsel. A real favorite of ours. 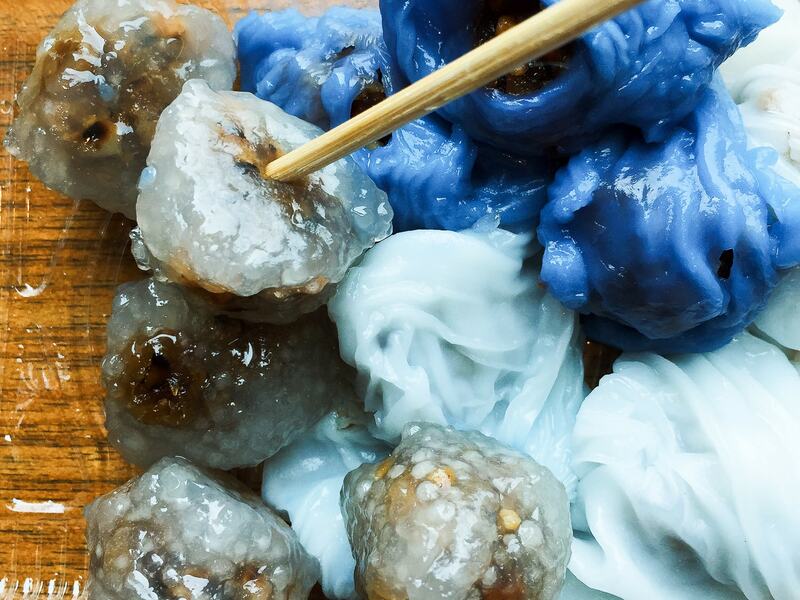 These steamed tapioca balls are typically filled with pork, peanuts, chili and sugar. The vegan version excludes the pork and occasionally has a meat alternative or just peanuts, chili and sugar. The chewy glutinous tapioca also helps to temper the heat of the chili just a bit, making these fairly mild. 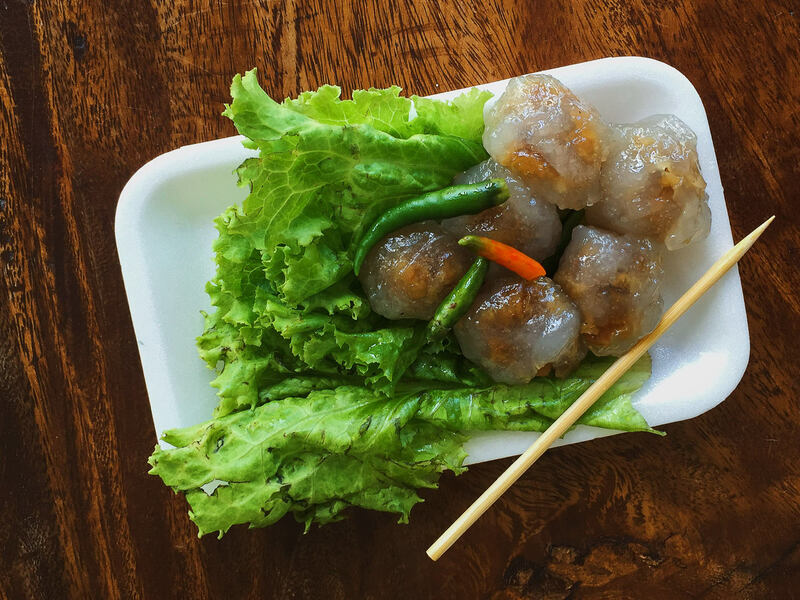 Often sold alongside Sakoo Sai with the same filling but instead of a tapioca starch skin, they use a steamed rice flour skin. The blue ones are naturally colored with butterfly pea flowers. A Thai version of a Vietnamese Banh Xeo. 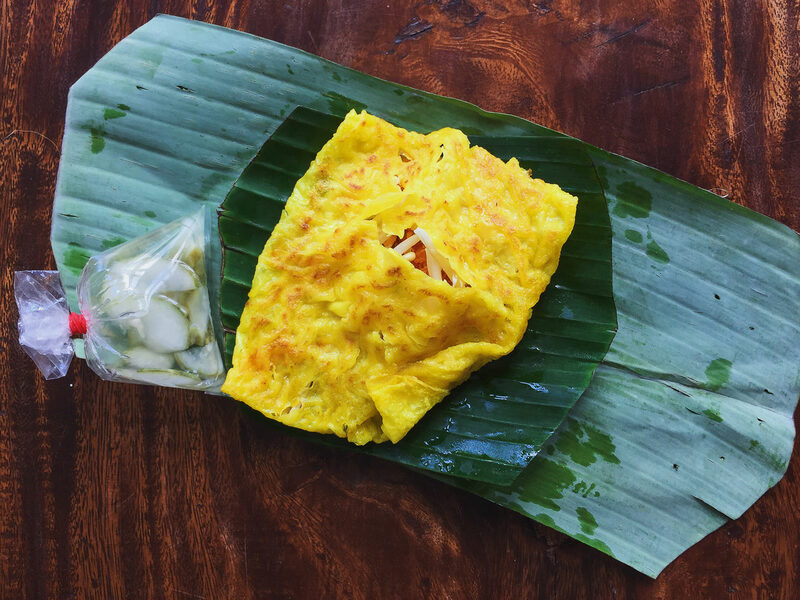 This light rice flour and turmeric crepe is filled with bean sprouts, radish, tofu, peanuts and orange toasted coconut and served with a simple pickled cucumber sauce. 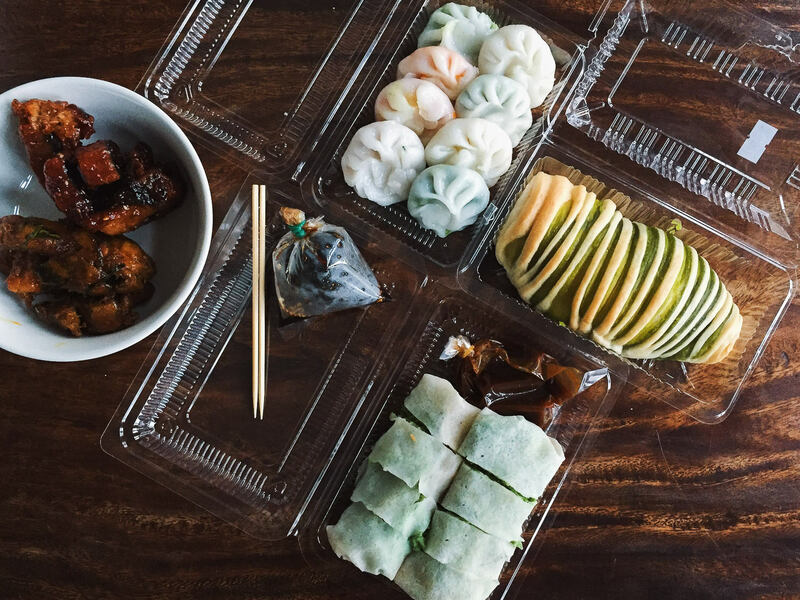 While the Matcha Bun is sweet, the others are a few of the typical savory snacks found at the festival. Popiah is one of our favorite light bites during the festival. The almost paper thin wheat flour wrapper is filled with vegetables and vegan char siu and served with hoisin sauce. Available in a variety of flavors. 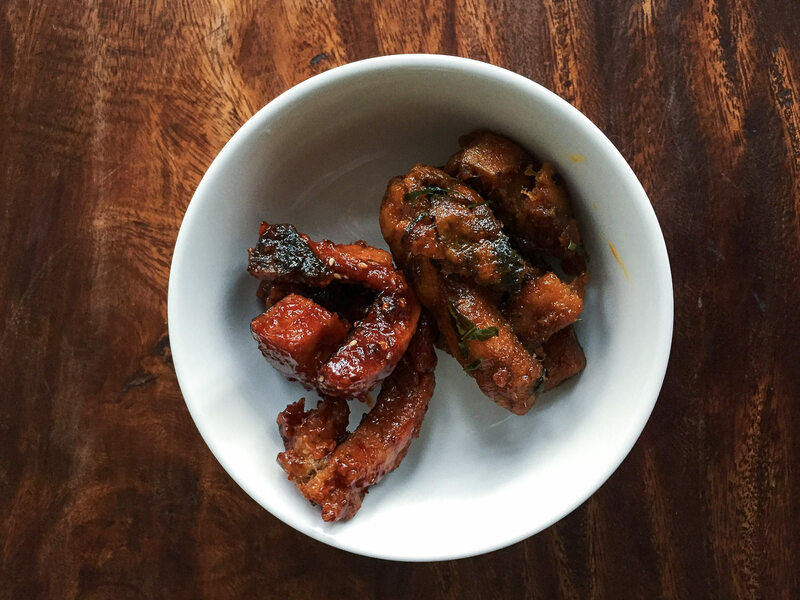 Some are slightly sweet while others are robustly spicy. While relatively expensive, these are unlike any vegan meat alternative we’ve previously tried and all of them were absolutely flavorful and delicious. In 2015 we noticed an increase of Japanese food at the festival. There were multiple vendors selling Takoyaki. 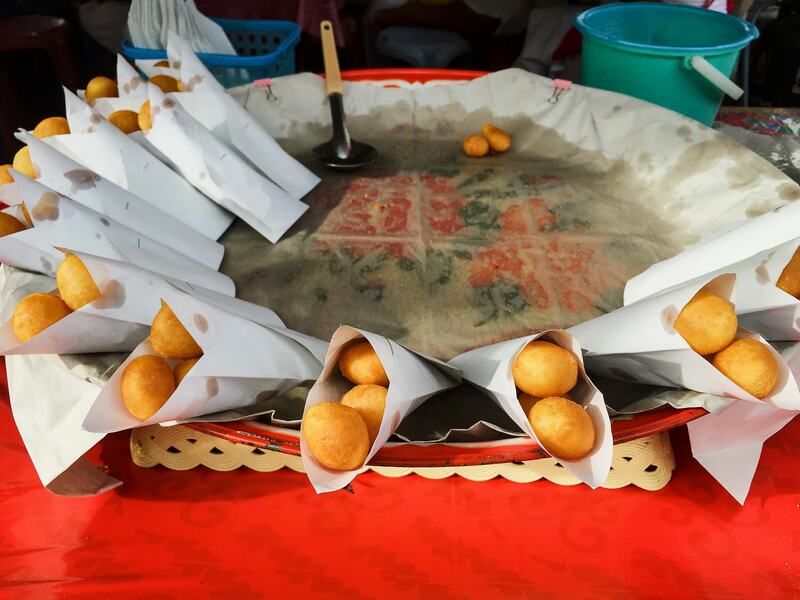 These savory wheat flour balls are filled with mushrooms and vegetables and cooked in a hemispherical griddle. 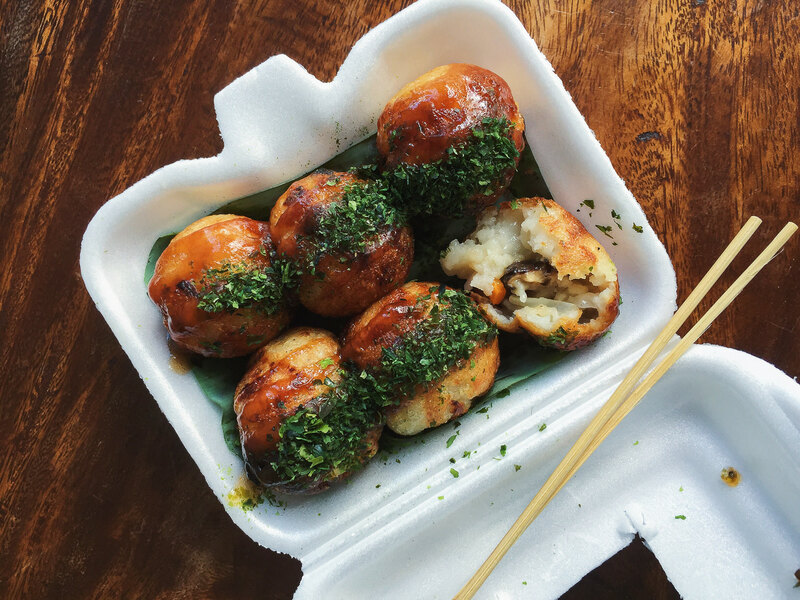 These were topped with seaweed and sticky sweet & salty takoyaki sauce. Some vendors also included a drizzle of vegan mayo. 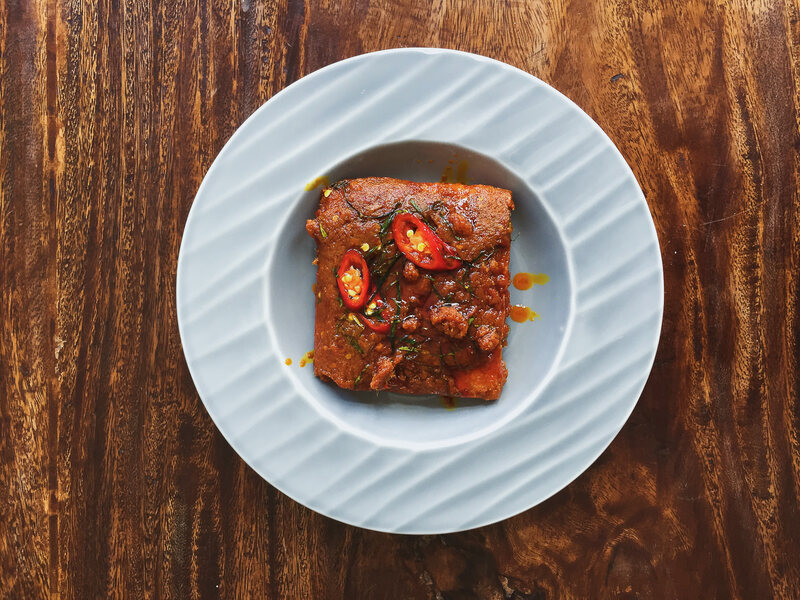 This vegan fish slice is coated in a thick red curry paste and garnished with kaffir lime leaf and chili. A personal favorite but also quite strong and spicy. A sweeter alternative to the spicy red curry fish from the same vendor. 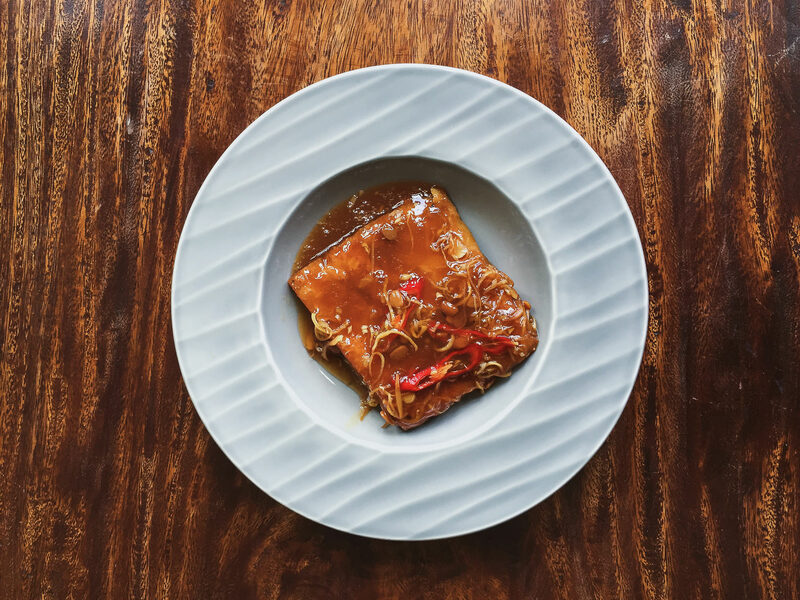 Garnished with chili and lemongrass; it has a nice, balanced flavor without the heat of the curry fish. From a small vendor on Yaowarat Road just off Ranong Road. This small family run stand would set up at night. Outside of the festival they run a non-vegetarian restaurant on the island. 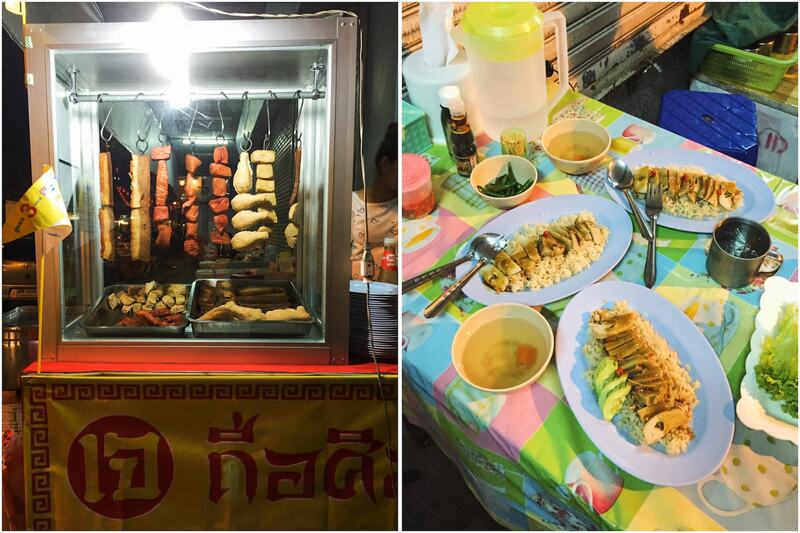 Along with Khao Man Gai, they had other vegan meat & rice dishes available. A wide rice noodle soup with a big crispy wonton wrapper and an assortment of proteins and vegetables. This noodle soup has a pink color due to the addition of fermented soybean paste. Stands selling these have prepared bowls just waiting for a dash of broth to be poured over them to serve. Vegan Yen Ta Fo waiting to be finished with a dash of broth and served. Fermented thin rice noodles with a choice of curry sauces. Garnish with the fresh and pickled ingredients of your choosing from communal plates on the table. This is often served during breakfast hours at the festival. The yellow one, Nam Ya, is the more mild of the two. Nam Prik is crunchier due to the addition of roasted peanuts. 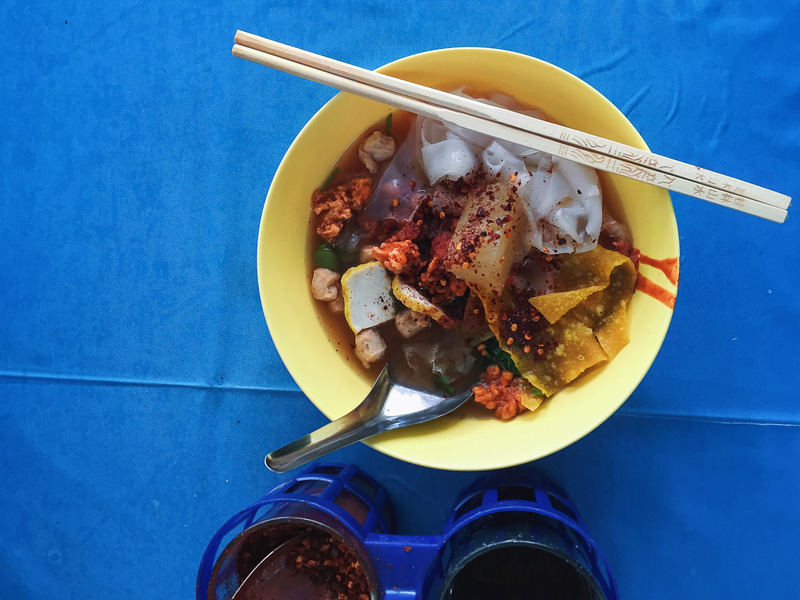 If you’re familiar with Singaporean cuisine then you might recognize the Kway Chap sold at this small stand on Ranong Road. This stand was only open in the evening and appeared to be new for 2015. 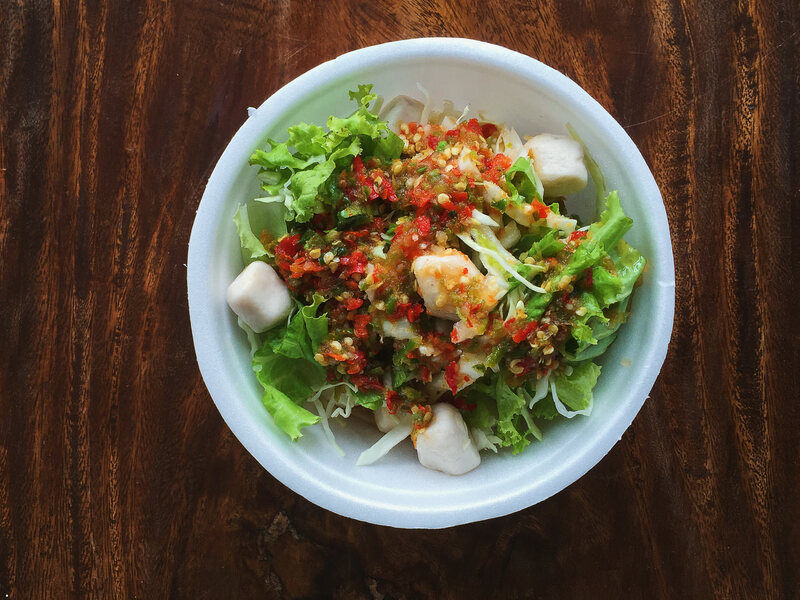 This simple dish combines Vegan fish balls with lettuce, shredded cabbage and a generous amount of chili-lime dressing for a tart and spicy cold salad. Shredded curried mushrooms wrapped in a banana leaf and charred on a grill. It’s aggressively spiced and packed with flavor. The non-vegan version, made with fish, is called Hor Mok. Sold in bags with the crispy noodle garnish, soup base and other contents separate. It’s an ideal dish to take home, assemble and reheat. 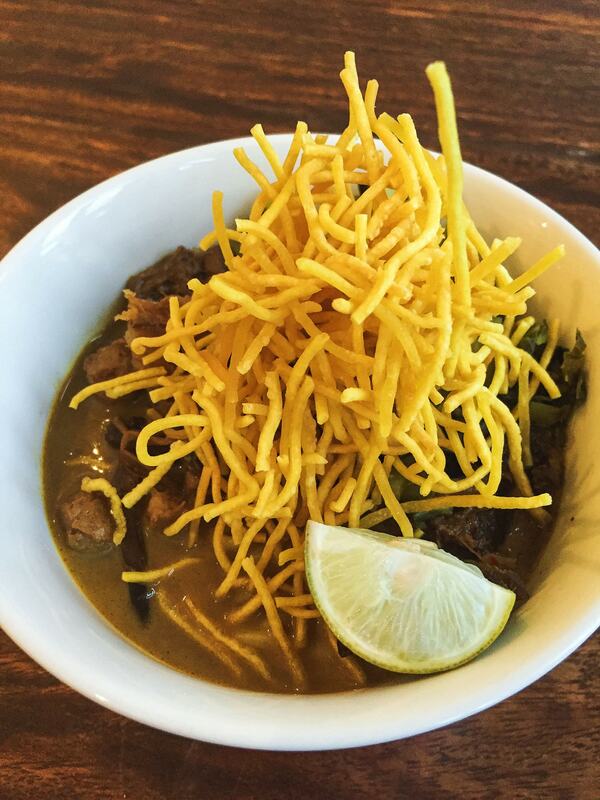 Since most Khao Soi use crispy egg noodles, it’s nice to find a vegan version. 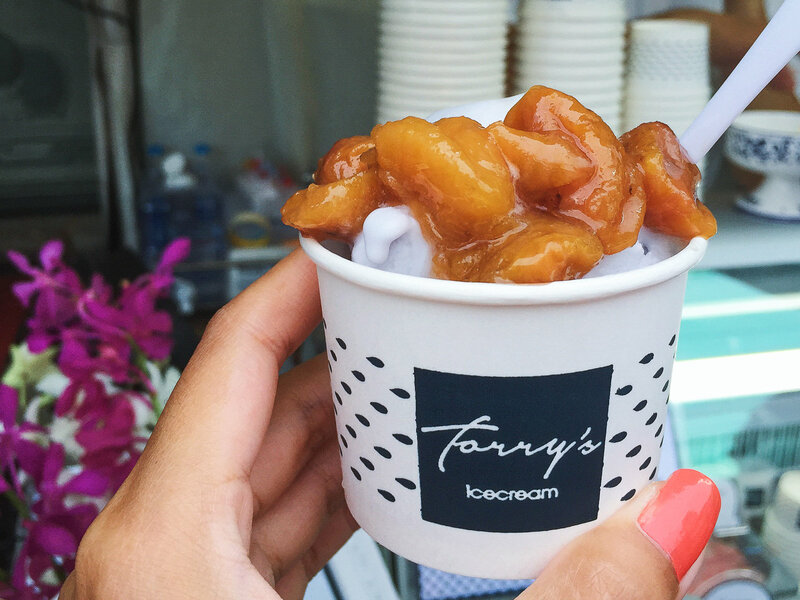 Coconut Ice Cream with caramelized banana on top from Torry’s Ice Cream, butterfly pea flower gives the ice cream a beautiful blue tint. A new ice cream shop in Phuket opened a stand just outside the Jui Tui Shrine off Ranong Road for the 2015 Festival. 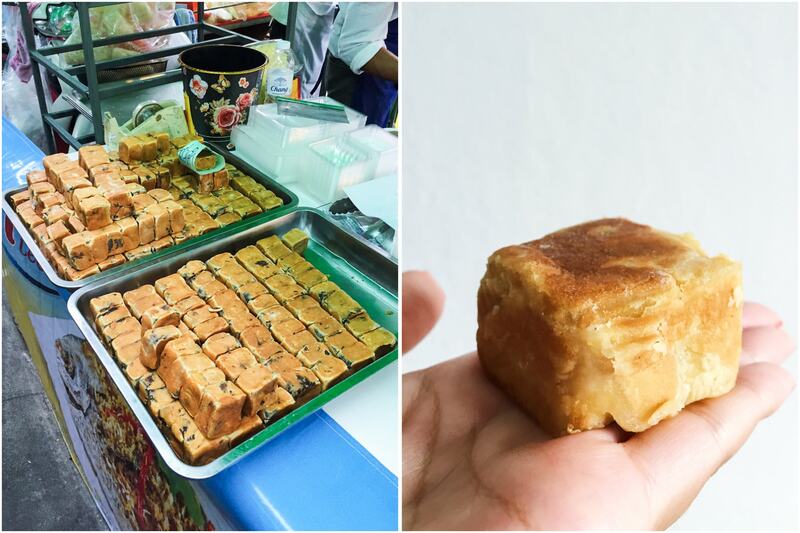 Torry’s currently has a brick and mortar shop in Phuket Town with vegan options and a still takes their stand to a variety of markets and events on the island. Worth ordering just for the experience of watching them crack open the bamboo poles with a hatchet. 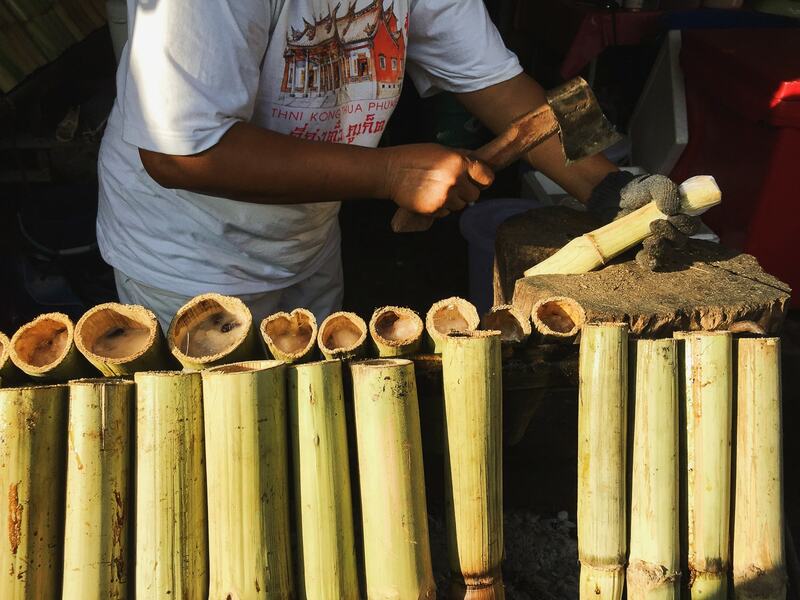 Small bamboo poles are filled with sticky rice, black beans and sweetened coconut milk before roasting over an open fire. Also available with black rice. 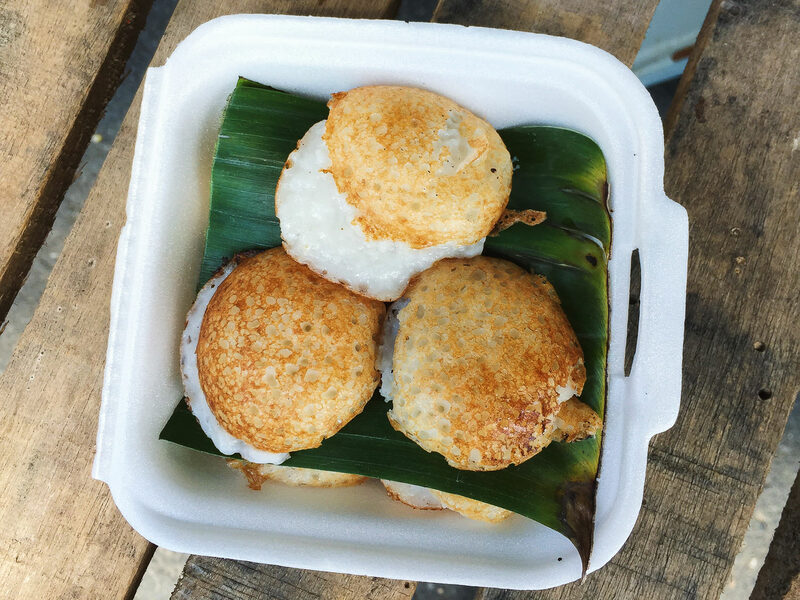 These Thai steamed muffins are essentially the same as Chinese steamed muffins. Light and airy and available in a variety of colors and flavors. Can be made with rice flour, all-purpose flour or a combination of the two. Similar to a traditional Chinese pineapple cake. These little bready cubes have a dry, flaky exterior and a rich, dense, sweetened filling. 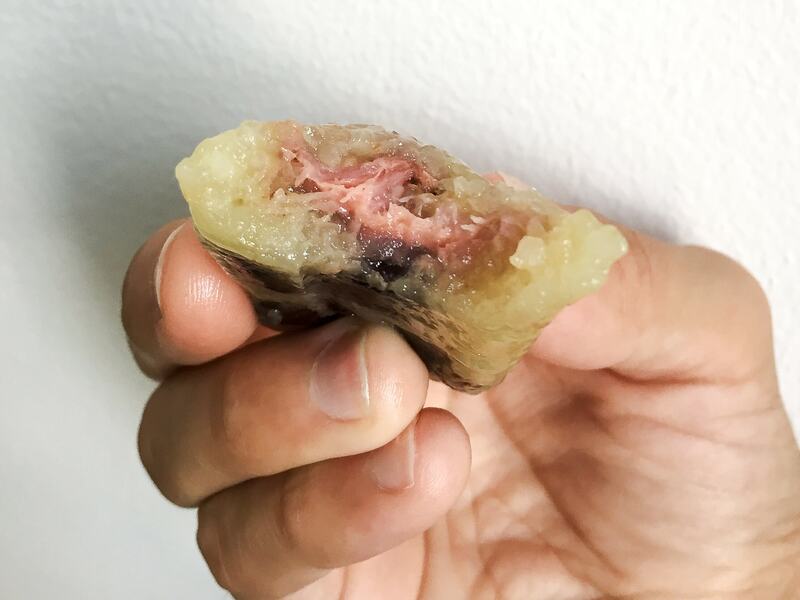 Vendors often have a selection of fillings to choose from, this one is red bean. When enjoyed hot on the street, are a real experience not to miss. This simple rice flour and coconut custard is cooked in a hemispherical griddle until golden brown on the outside. Though golden and slightly crisp on the outside, the filling remains a creamy molten custard. If you eat them while they’re still hot, they’ll melt away in your mouth. It is one of the most amusing and colorful desserts we tried. Watching the paper thin roti wrapper being made by hand is rather remarkable. 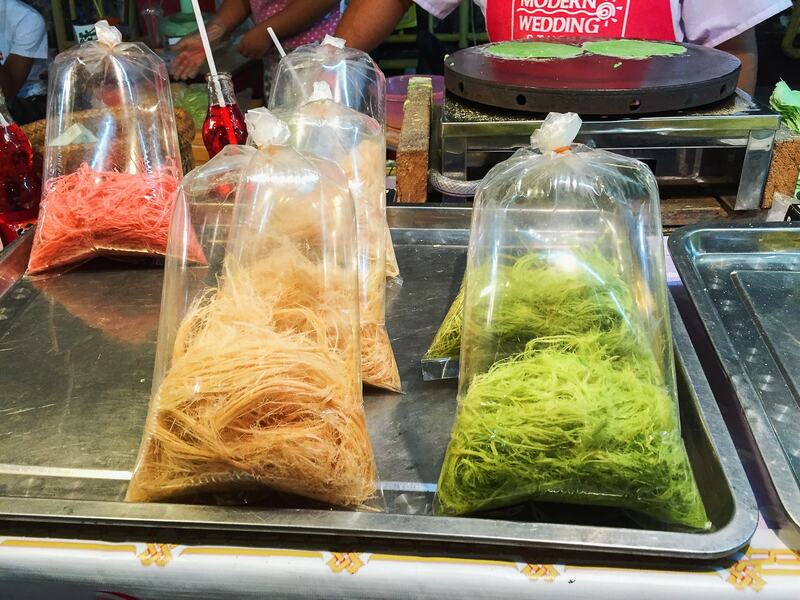 The roti is similar to a popiah wrapper and dyed green with pandan. 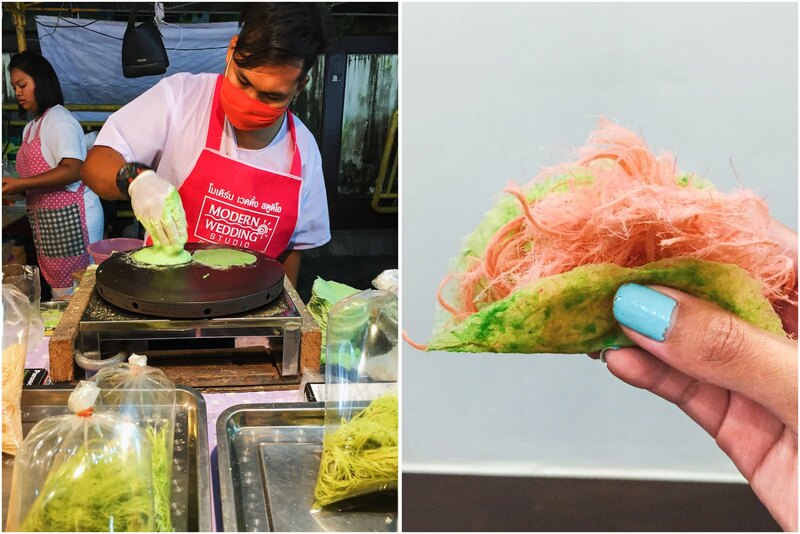 Roti Sai Mai is served in two bags, roti in one and colorful fresh candy floss in the other. Assemble the roti sai mai by adding the candy floss to the roti and enjoy. It is a coconut and tapioca flour custard often sold in little bite sized banana leaf cups. A personal favorite of ours, they’re steamed and have a soft, chewy consistency with a distinctly creamy coconut flavor. 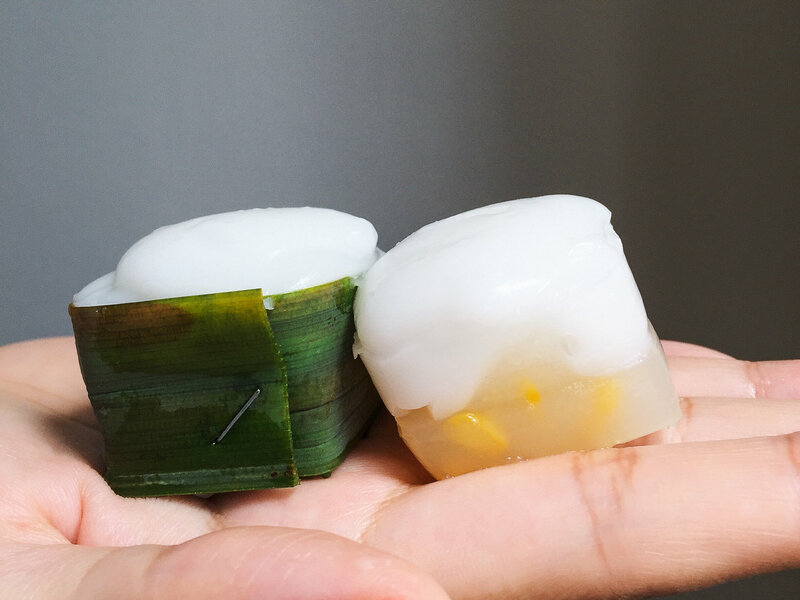 Sometimes the bottom layer is a clear tapioca starch, other times the banana (or pandan) leaf cup is filled entirely with the coconut-tapioca starch mixture. 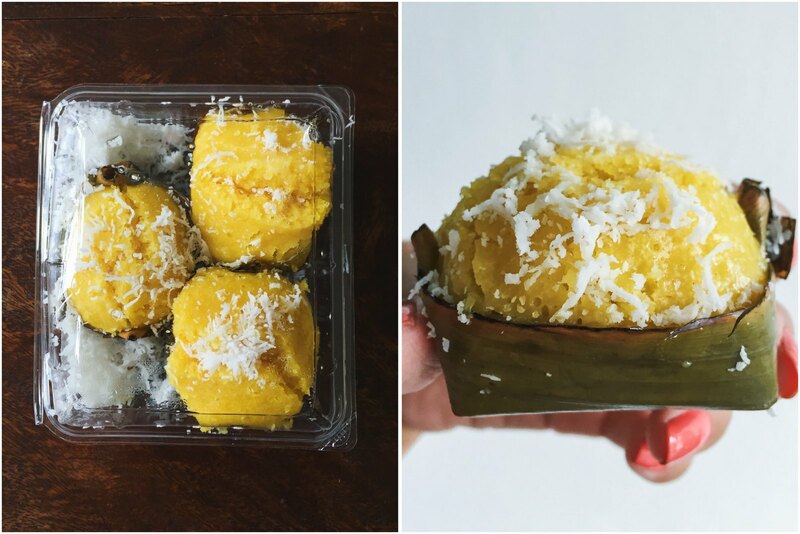 The Takoh on the right has a tapioca starch bottom with corn and a coconut custard topping. 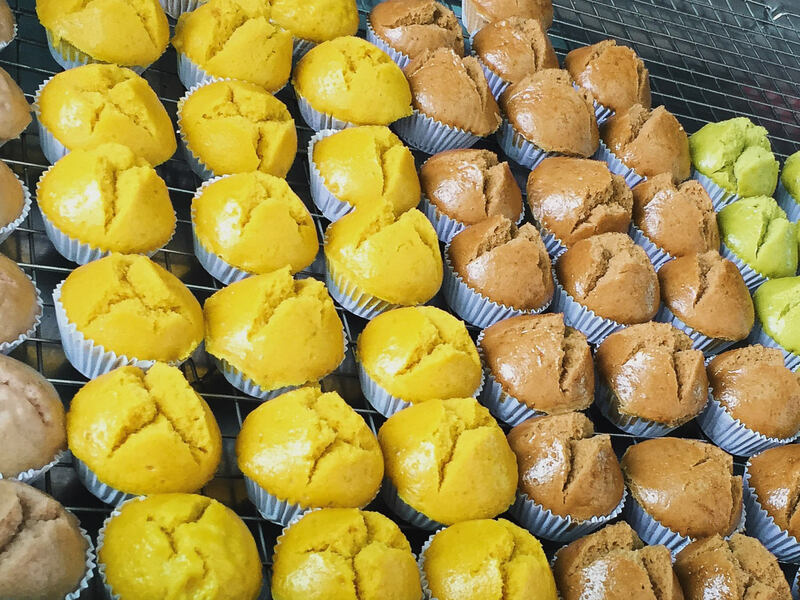 These are steamed palm sugar muffins. They’re light and fluffy and not too dissimilar to Khanom Tuay Foo. The palm leaf wrapping used for steaming the muffins gives them a rather traditional appearance. Can be served with shredded coconut on top. This vegan sweet snack combines sticky rice with banana, black beans and sweetened coconut milk. 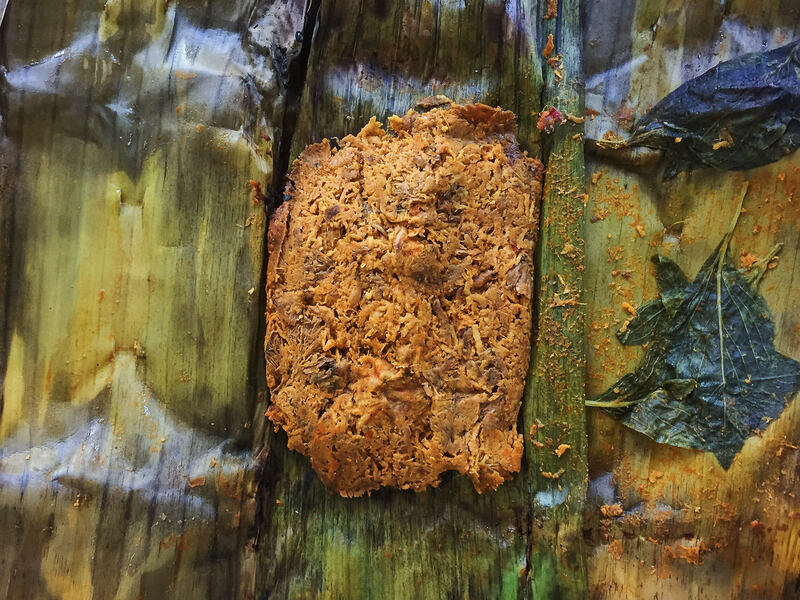 It’s all wrapped in a banana leaf and steamed, grilled or boiled. A chemical reaction causes the banana to turn pink while also becoming soft and creamy. 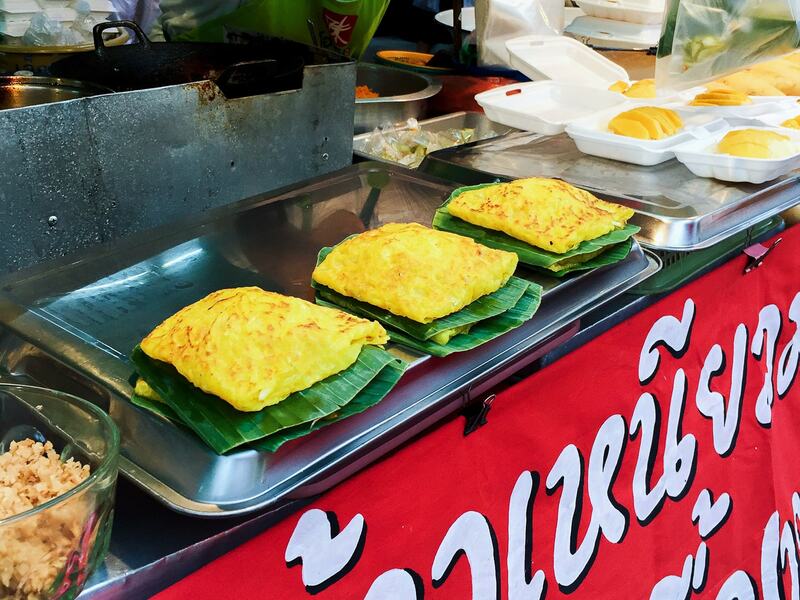 Do you have a favorite Thai sweet or savory snack?